At last nights AGM the members unanimously accepted the proposal of Connie Jaffrey, Troon Ladies, for Honorary Membership of the Ayrshire Ladies County Golf Association. New Captain, Liz Wilson, Barassie, highlighted a number of Connie's many golfing achievements over the past 9 years. 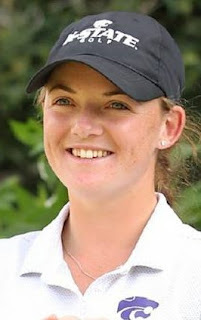 From her debut in the Junior Kennedy Salver team in 2008, aged 12, to winning the Scottish Ladies Amateur Championship this year and many other highs in between! Connie is in her final year at Kansas State University where she recently picked up her 4th individual title with an impressive 3 round total of 9 under par. Connie was absolutely delighted to accept this honour.